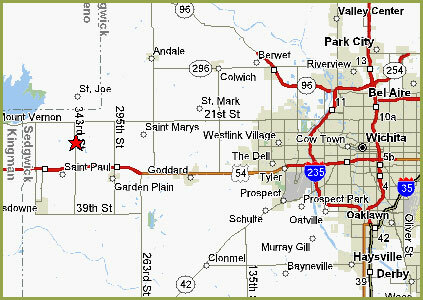 Eagle Valley Raptor Center is an easy twenty-five minute drive from Wichita on Kellogg (US-54). The overpass for 343rd Street is relatively new, and has very nice, large signs. The drive North on 343rd is only two miles, and EVRC is on the West side of the road.